An organization aimed at reducing the “carbon footprint” left by regattas, Sailors for the Sea has partnered with the America’s Cup in an effort to bring to light the potential of all regattas — big or small — to minimize their effect on the environment, particularly the ocean. Founded by David Rockefeller Jr. in 2004, the group really began its work in the public realm in 2007, with the hiring of executive director Dan Pingaro. Over the past four years, the team has crafted a list of best practices for hosting a regatta and created a Clean Regattas Program. Designed to be scalable for regattas of all sizes, the list includes tasks ranging from water bottle reduction and oil spill prevention to use of alternative fuels for support boats and purchasing carbon offsets. An international event, such as the America’s Cup, can aim for a Gold-level certification (15 completed of the 19 possible tasks) — however, small local Sabot or Opti regattas at even the junior level can also implement a variety of Clean Regattas steps to make their events more ocean-friendly. In addition to the Clean Regattas certification program, Sailors for the Sea has introduced Rainy Day Kits, environmental lesson plans focused on marine ecology that can be taught to young sailors in yacht clubs and sailing programs around the country; and Certified Sea Friendly, a voluntary certification program to transform the marine manufacturing industry and make the construction, maintenance and operation of vessels more environmentally friendly. As the America’s Cup World Series came to San Diego Nov. 12-20, so did Sailors for the Sea, opening up a display booth in the Healthy Oceans hall on San Diego’s Broadway Pier. And Rockefeller got to join in on the racing, hitching a ride aboard French Team Energy’s AC45 catamaran during the Nov. 19 match racing championship final against Oracle Racing’s James Spithill-skippered boat (one of two Oracle Racing boats in the competiton). The seat, often saved for team owners or celebrities, was given to Rockefeller to experience the race firsthand — and he jumped at the opportunity. The Log spoke with Rockefeller and Pingaro about the ultimate sail racing experience, and what Sailors for the Sea hopes to accomplish — both on the local level and internationally — through its partnership with the America’s Cup. The Log: What was the race like? David Rockefeller Jr.: When I stepped aboard just four minutes prior to the starting pattern, the skipper clearly instructed me to mimic his moves in crossing from one side (of the tramp) to the other, but always to have a tight grip on the red Spectra lanyard at the very stern of the cat. We won the start, and I was sure we were over the starting line early along with Oracle Spithill, but we were not. Probably just a matter of a few feet from the line. My time on AC 45 Team Energy was brief, but it was impressive to see the excellent teamwork and high crew output required on the short course. Did you feel like part of the crew? Rockefeller: The crew, appropriately, paid no attention to me during the race, although at two separate times I felt we were failing to cover — once on the second downwind leg when Spithill was working deep on us, and right after the next leeward gate when we failed to cover his choice of the left. I did try a few thumb jabs in the air, but was not noticed. Easy to second-guess these things, but Spithill took us on the ensuing beat and covered nicely into victory. I was honored to be aboard and sorry for the French, that they did not complete the week as a surprise overall victor. What spurred your interest in starting Sailors for the Sea? Rockefeller: I’ve been a lifelong sailor and grew up on the East Coast. I’ve sailed many oceans in my life, but it wasn’t really until the 1990s that I began to understand that there were ocean health issues. So, although I was a conservationist on land, I suddenly realized the oceans had problems, not just with rivers and forests. I was asked to join the Pew Oceans Commission, which focused on a three-year study on oceans and developed amazing research on ocean health. After the Pew Commission, I asked myself, “What can I do? I’m not a scientist.” But I looked around and I identified that there was no conservation organization made up of sailors. There are some fishing groups that are good conservationist organizations, but that was their own niche, and so I founded Sailors for the Sea. Dan, what brought you on board? Dan Pingaro: I grew up on the coast in Huntington Beach, along the Bolsa Chica Wetlands, and I lifeguarded at the state beaches there. My interest and love for the ocean is essentially something I’ve had since childhood; it was innate. Before coming here, I worked on marine policy issues, and that really catalyzed my interest in what I could do personally, seeing that there was a great need out there to help the oceans. A lot of organizations like the Surfrider Foundation do a lot of good work, but I looked around one day when I was walking down the docks to go racing, and I realized there was no organization for the sailing world. And When David founded Sailors for the Sea, It was a perfect marriage of what I felt was an opportunity in the ocean conservation arena to bring an untapped constituency to the marketplace and bring them a voice. Is Sailors for the Sea for more than just sailboaters? Rockefeller: Sailors for the Sea is about both sail- and powerboats. The market in the United States is something like 10 million powerboaters and 2.5 million sailboaters, so it makes sense for us to be interested in each. There are a lot of crossover owners and people who enjoy both power and sail. In fact, the Navy calls their men sailors. It’s a more generic term than most people are used to. Pingaro: We really feel that our programs link knowledge to action, and we want to empower the sailing and greater boating community to take action, to create a positive change in our oceans, and we can do that through our Clean Regatta program; providing resources to individuals, regatta organizers — such as the America’s Cup or your local sailing center — to reduce their carbon footprint on land and sea. We do our Rainy Day Kits, which are educational, science-based education kits for junior sailors, which we partnered with Scripps to put on. Those rainy day kits came out in February 2011 — and, already, 10,000 students got to partake in that program. Our next program goal is to get our Certified Sea Friendly project off the ground. The concept there is to work with the marine industry on a LEED-style (Leadership in Energy and Environmental Design) program, from design to building, to manufacturing, to maintenance, to end-of-life issues with recreational sail and powerboats, to reduce their environmental footprint, to talk about the social and health benefits of the green building techniques. Rockefeller: We’ve reached a lot more, but right now we have about 7,000 active members. If we could get 25,000 active members or followers within the United States, that would be really a good number. That would be about 1 percent of the sailors in the United Stated that would be learned in the matters of Ocean Health, and how to be ocean stewards. I think that’s a good national goal. But we talked about expanding internationally. We have a Yokohama, Japan office that just opened a couple of weeks ago, so we are becoming an international organization, though we began as a national one. I would hope after the America’s Cup, we would have 25,000 people making regular contact with us; at least that. And that’s a very good number for an organization like ours. What has the America’s Cup World Series partnership meant to Sailors for the Sea? Rockefeller: This is our first really big event. We’ve done some other things where we were very visible, like partnering with the Atlanta Cup and Eleventh Hour Project, but this is certainly the largest. For us to get the word out, we need to get to where sailors are, and sailors are many places. They’re at yacht clubs, college sailing programs, community boating programs, local regattas and larger regattas like the America’s Cup. To reach sailors in a more of a wholesale fashion, we decided to connect to enterprises where sailors were members or very active — and that’s how Clean Regattas got started. Pingaro: This is by far the biggest branding opportunity for us as an organization to squarely put the sailing community at the table for ocean conservation, alongside World Wildlife Fund and Surfrider Foundation. We are the only organization focusing on sailing in the environment, and we can bring the sailing and boating community to the national and international conservation table through this event. Pingaro: Our Clean Regattas program is a scalable program. Whether you’re in Sabots and Optis with junior sailors, all the way up to the best sailors in the fastest boats in different venues around the planet, the program has a low barrier of entry. It’s easy to do for volunteers, and it has a great return on investment. What we’ve seen, both at Cascais (Portugal) and in Plymouth (England), and I’m sure we’ll see it in every location, is that the local sailing community sees the program in action at the America’s Cup, and sees the value and benefit in the environment. We see a legacy in Cascais, with them running clean regattas out of their local sailing organization already. In Plymouth, there are three different yacht clubs running Clean Regattas now, and the United Kingdom National Aquarium based in Plymouth is helping us create a Rainy Day Kit. We end up making the link locally because our programs are scalable. Rockefeller: We had our board meeting over at San Diego Yacht Club while in town, and they have an incredible junior program with a brand-new state-of-the-art facility. That’s certainly nice to see, because they’re not only focused on the big regattas and events, but also the young and up-and-coming sailors. We think similarly, and we know we have to cover the entire waterfront in order to be credible and in order to make a difference — and who knows where next Dan Pingaros of the future are going to be trained? Explain the Certified Sea Friendly program. Pingaro: Right now, there is nothing in the marine industry like it. 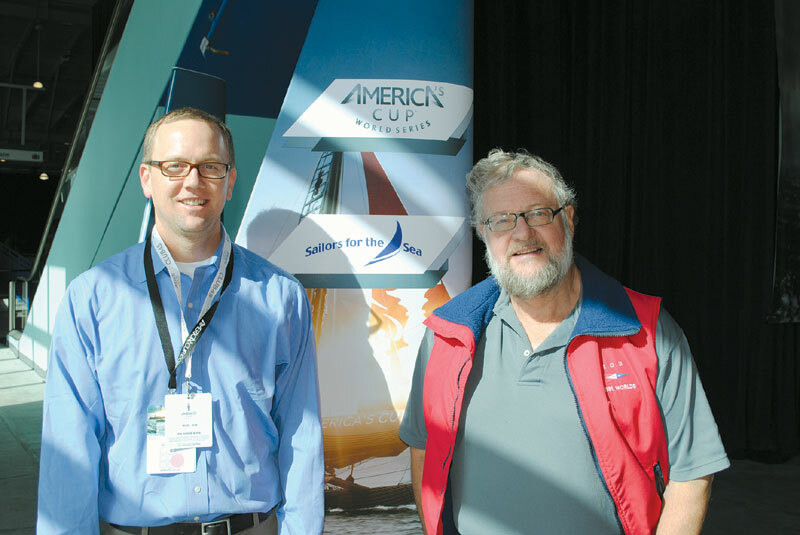 We are reaching out to marine industry professionals in all disciplines — from naval architecture to manufacturing — and we are also reaching out to like-minded affinity groups, such as the U.S. Green Building Council, and LEED-certified building architects to help infuse our program and move it forward in the most appropriate manner. We are not intending to reinvent the wheel. We will utilize the best and the brightest in a collaborative opportunity, which is what we do with all of our programs. One of our board members and advisors, Bob Johnston of J Boats, very much believes in this program and as a professional in the marine industry, he champions the concept that we take Certified Sea Friendly forward. It’s a value not only to the environment and humans, but also to create working waterfronts and clean marinas. Whether you’re in San Diego or Miami, or up in Seal Harbor, it’s our common cultural heritage from Maine to San Diego to have a working waterfront. Pingaro: We’re looking forward to the Newport, R.I. series leg, which is the hometown of our offices, and I think that gives us another great opportunity on the East Coast to really amplify our message and our programs and to work with other nonprofits in the ocean community. And after that, there are two more San Francisco events. NEWPORT BEACH — While many changes are coming to this year’s Newport-to-Ensenada International Yacht Race, April 27-29, none is more important to the race’s future than the decision to partner with Sailors for the Sea and sign on as a Clean Regatta. As part of the Clean Regatta program, race organizers at NOSA will be promoting the use of reusable water bottles rather than single-use disposable bottles, as well as recycling at all race events. Racers will be urged to make this a trash-free race and to use nontoxic marine-friendly products while on board. For more information on the Newport-to-Ensenada Race, call (949) 644-1023 or visit nosa.org.